← Marne au Rhin ouest – the Mauvages tunnel. Along the Canal lateral a la Marne which took us from Vitry-le-Francois to Epernay. We didn’t stop in either of these cities. Then into the River Marne from Epernay to Alfortville where it joins the Seine for the last five kilometres into Paris. 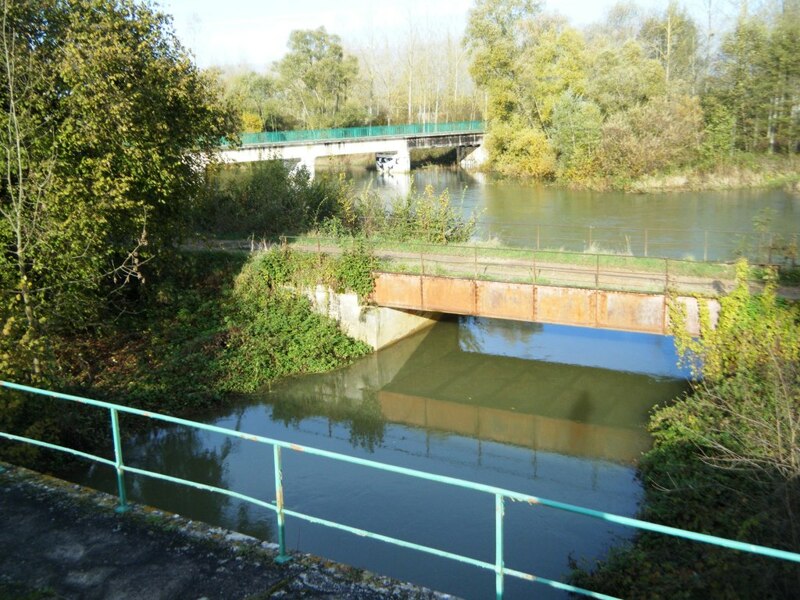 Our story along this section is one of water in abundance, delightful surprises and a few awful ones as we passed through the Champagne and then Brie regions of France. Map showing the five regions of Champagne country. 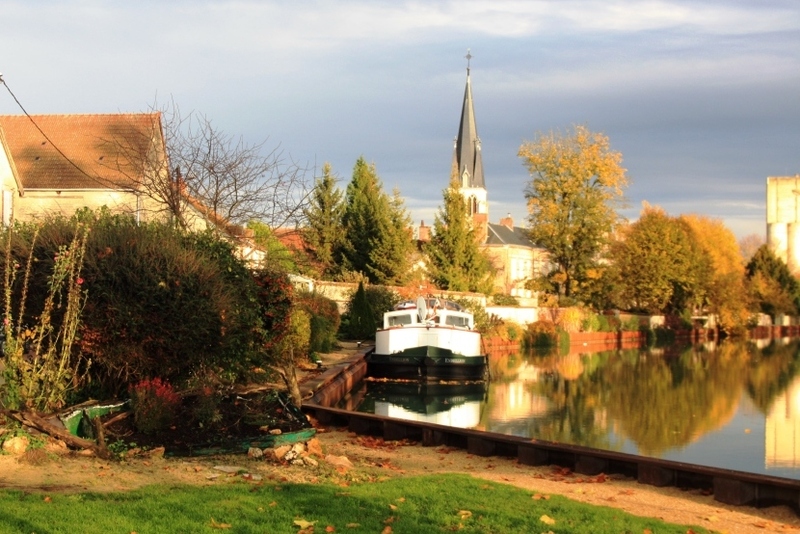 Just before the end of the canal de la Marne au Rhin (where we left off in our last blog) we stopped at an excellent mooring at Pargny-sur-Saulx. A rare stretch of lift bridges where two lanes of traffic have to wait for us while the road lifts and lets us through. We pass many aqueducts every day in this region with rivers flowing under and around us much of the time. The canal (lateral a la Marne) runs between this river, the Saulx, and the Ornain and with the continuous heavy rain we’d been having we noticed more and more water building up. We were frequently using aqueducts to cross the rivers as they meandered beneath and around us, and in some places it was quite hard to make out the sides of the lock on approach because the water was almost brimming over. 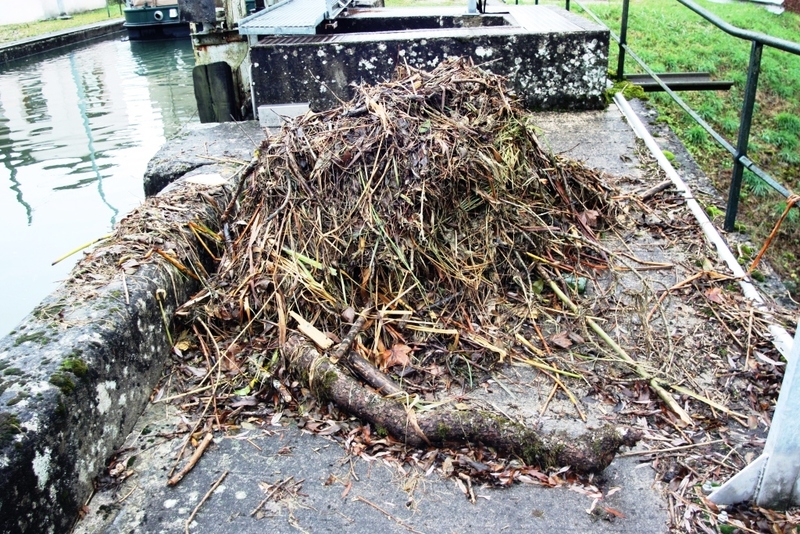 Piles of debris from the Autumn change meet us at many of the locks. 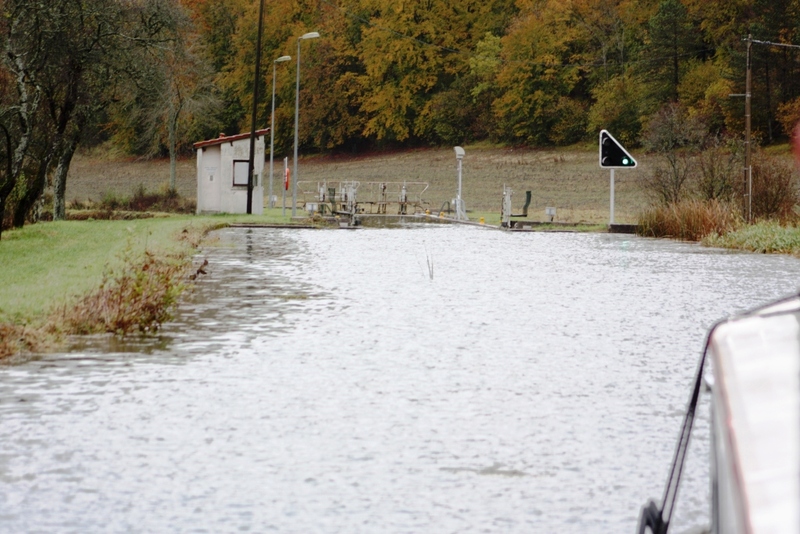 The canal and locks are full to overflowing and sometimes difficult to see the sides when entering. At one stage a lock-keeper (few and far between) asked us what our draft was (depth in the water) which is a very unusual thing to ask considering there was so much water around. Usually this question would be asked if they were concerned about lack of water. We thought for a moment it was because they were worried we’d float off over the canal bank somewhere (joking) given the high water level.. but no. 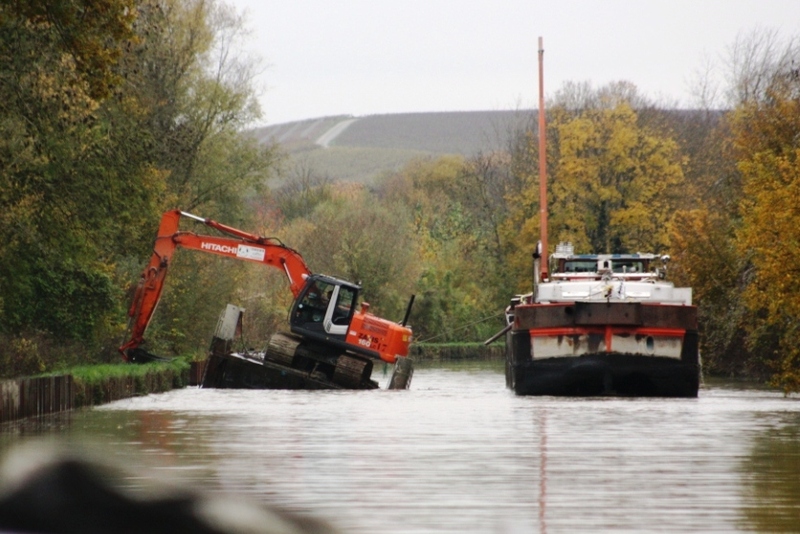 At this time of year there are many works taking place and soon after this questioning we were in a pound (a section between locks) which had been lowered to assist dredging. The skilful skipper of the dredge operator in action as he moves his excavator platform and then the barge so we can pass. The dredge operator, using an excavator on a floating platform, was amazing to watch. To move to one side to let us pass he used the mechanical arm with bucket to pull him over to the bank, just like an arm reaching out. In doing this the platform tipped dangerously to one side, he didn’t seem to worry! He then put down a spud leg (a post on board which drops deep into the canal to anchor it) and turned the arm around to pull the barge he was filling over to one side next to him so we could pass. What an amazing sight. 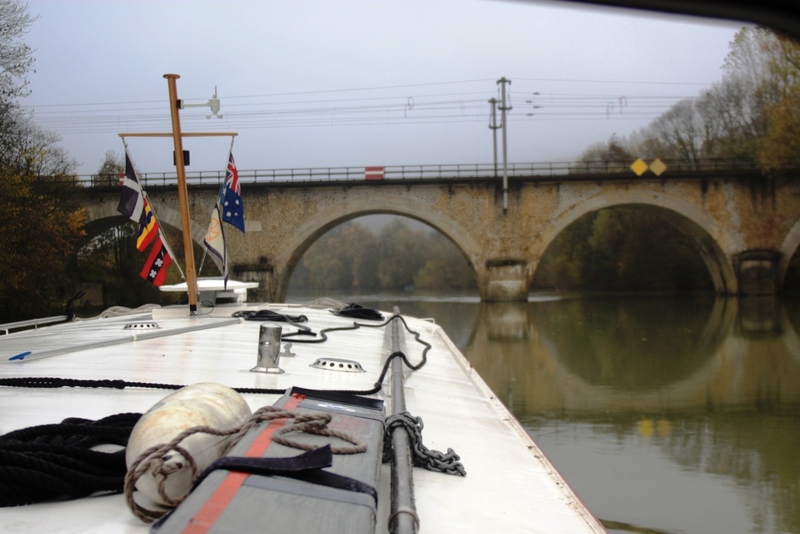 This section of the Marne is a canal with very little flow in the water, not many locks, each one taking us down. Stunning surprises left for us as sunshine appears and the banks sparkle with autumn colours. The next town we visited was Chalons, right in the heart of Champagne country. Lovely Chalons with the spires of it’s ancient church of Notre Dame. We were delighted by the huge number of half-timbered houses, reminding us of the Tudor style houses in some parts of Britain. 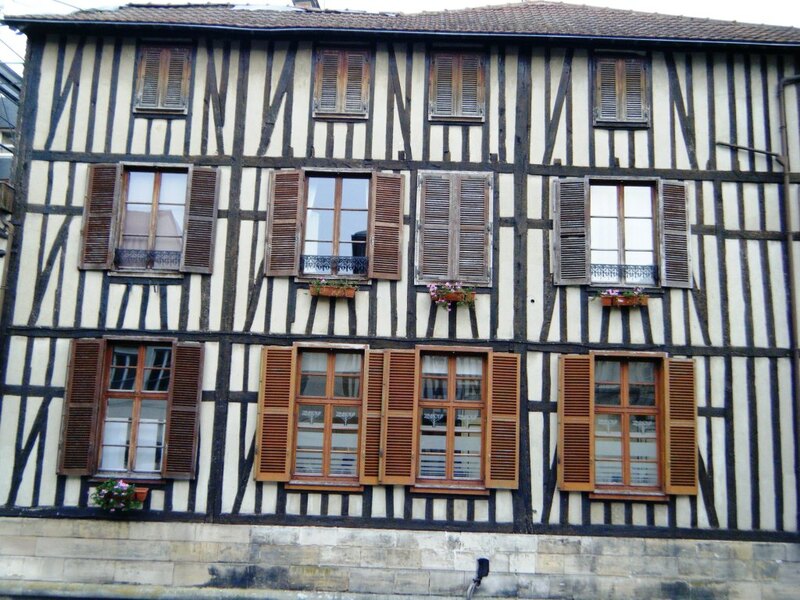 Beautiful half-timbered houses of Chalons. The peniche Melinda passes us carefully, and gives us a warm and enthusiastic wave. half-timbered house was built for a local notable in late 15th century with classic architecture of this period: gallery, corbelling on the side and facade and four-sided staircase turret crowned by a conical roof. 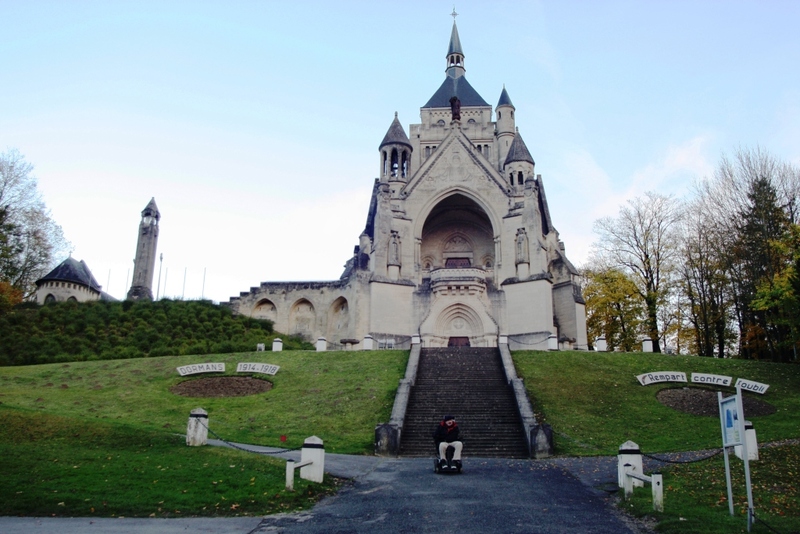 It was threatened with demolition as part of the usual ‘urban renewal’ of the 1970s, but was saved in April 1971 by an organisation formed to save old Chalons. The house was dismantled, material numbered and stored and then in 1977 it was rebuilt in the Notre-Dame quarter, where we discovered it. 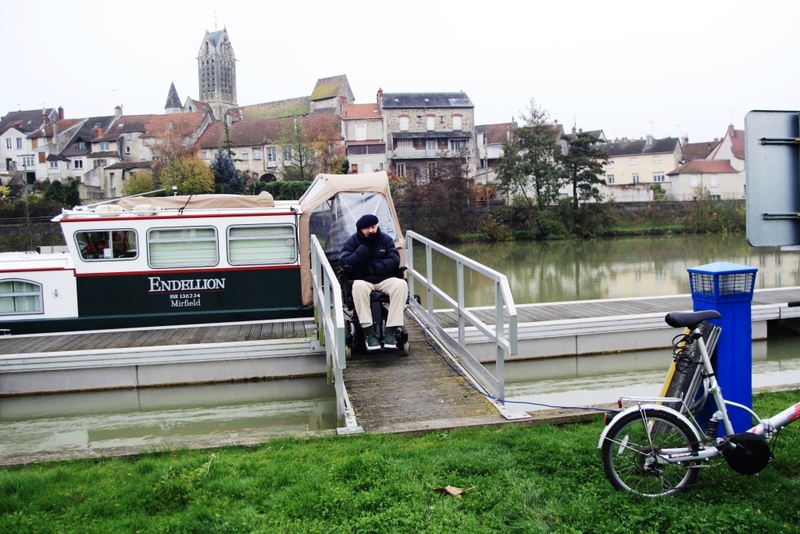 Endellion moored at Tours, the town we chose for the 11th of the 11th, Armistice Day. 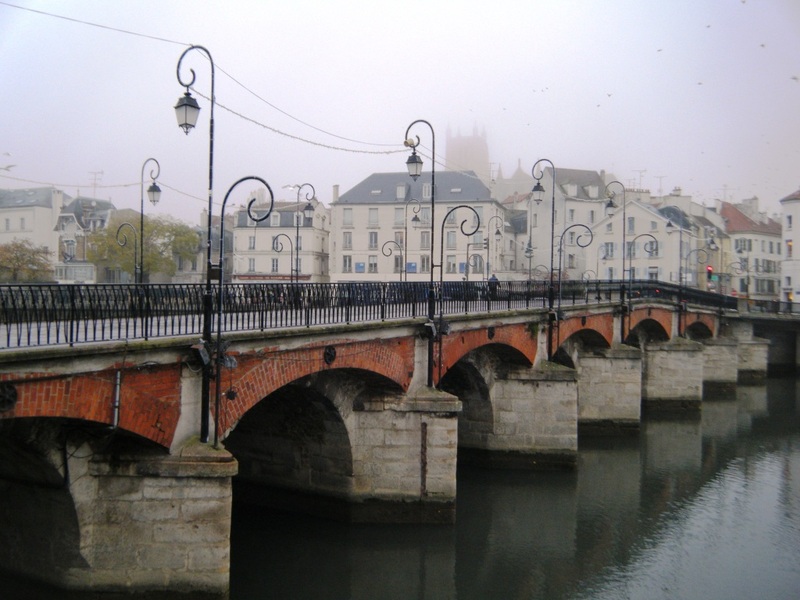 From Chalons we arrived in the small town of Tours-sur-Marne, the river Marne continuing to be only a narrow bank away from us and roaring down under the long arched bridge to Paris. This was our stop for Armistice Day, November 11th. Town band and dignitaries for the Armistice Day ceremony. 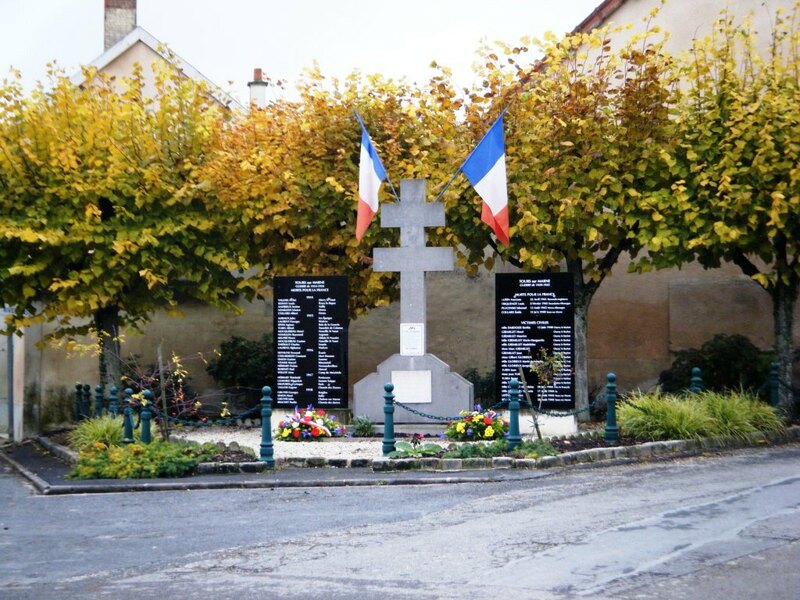 Tours is a smart but very quiet town and we were keen to take part in the annual commemoration of the signing of the Armistice which ended fighting in WWI. 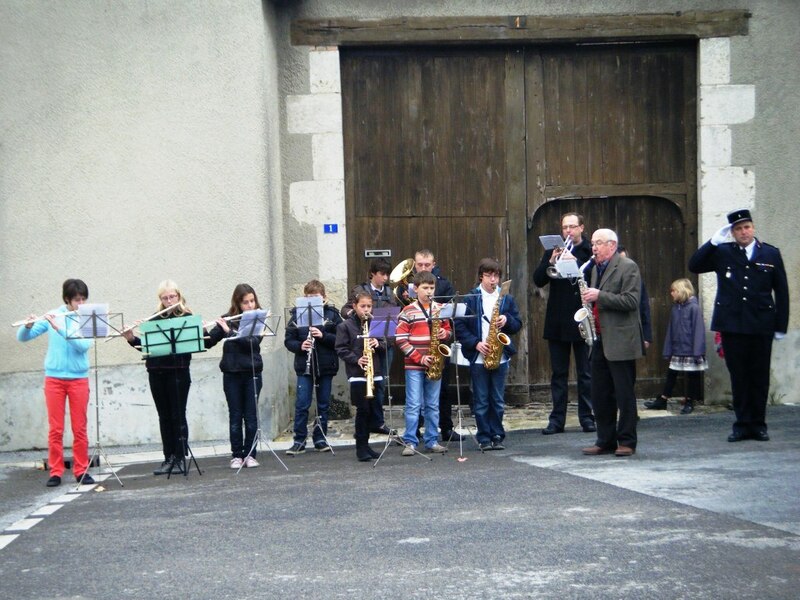 In France every village has some sort of ceremony on this day, we just had to find out where it was in Tours. We set off expecting an 11.00am gathering at the war monument but for a reason we don’t know it actually started at 12.30pm. The little square was moderately supported with local families, the six-strong fire brigade and the chief Gendarme (we think), two banner holders in casual dress and a woman striding around looking like she thought she was very important. The head of the fire brigade seemed to be ready to lead proceedings but it was not until a man in a long green coat arrived that things got under way, starting with the most delightful village band made up of all ages. 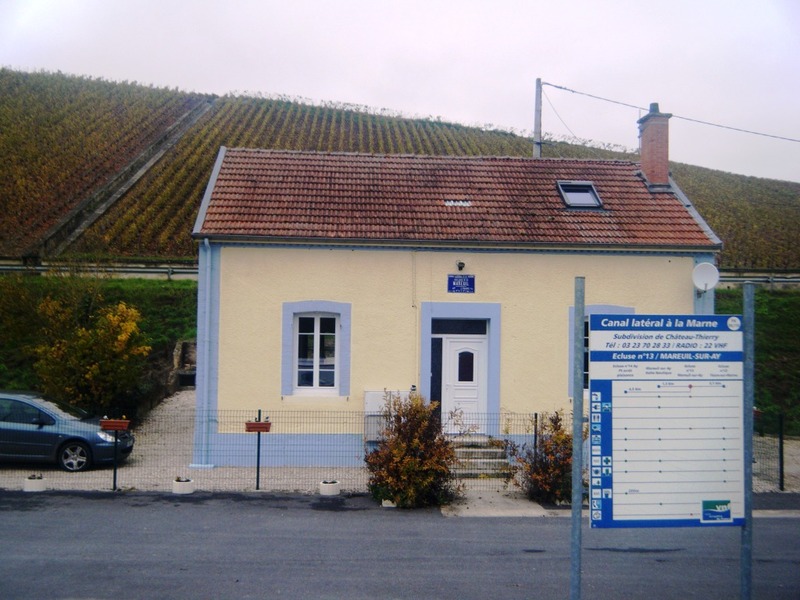 The locks and lock-keepers houses are completely surrounded by Champagne vines, of course. They played, then the two men in casual clothes stepped up to read the names of every solder listed on the monument from WWI: One saying the name and the other saying after each name “mort pour la France.” (Died for France). It was very moving. Then by 1.00pm everyone formed a procession to the local village hall and we detoured to the lovely Auberge (Inn) for Sunday lunch. We never did find out who the man in the green coat was .. the Mayor perhaps. The Battle of the Marne (WWI) war memoral at Dormans. So here we were in the heart of Champagne territory and still we hadn’t visited one of the prolific makers whose vines (now ‘empty’ of grapes) we could see all around us. The Vallée de la Marne (Marne valley) is one of the five Champagne producing districts (the others are Aube, Côte des Blancs, Côte de Sézanne, Montagne de Reims). 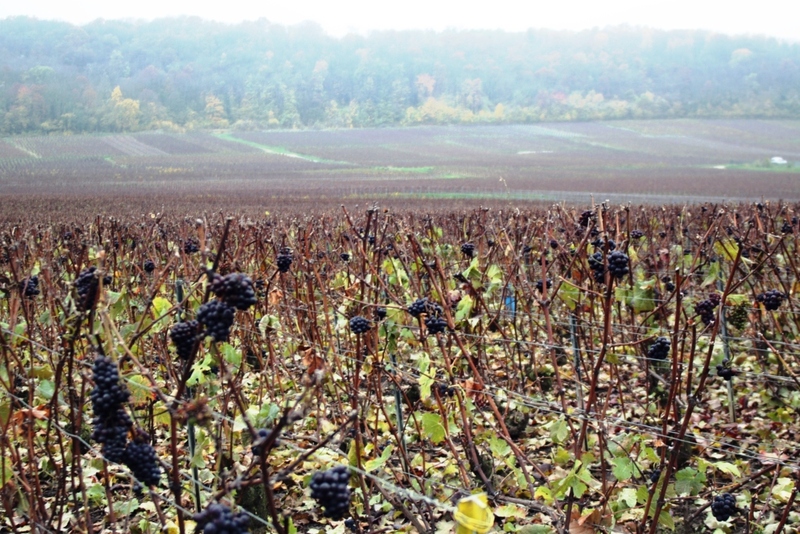 Growers typically own only two hectares of land (less than five acres), grow only grapes and usually sell them all to the big brand name houses such as Moet & Chandon, Piper Heidsieck or Veuve Clicquot. View across the vineyards at Nanteuil-sur-Marne. 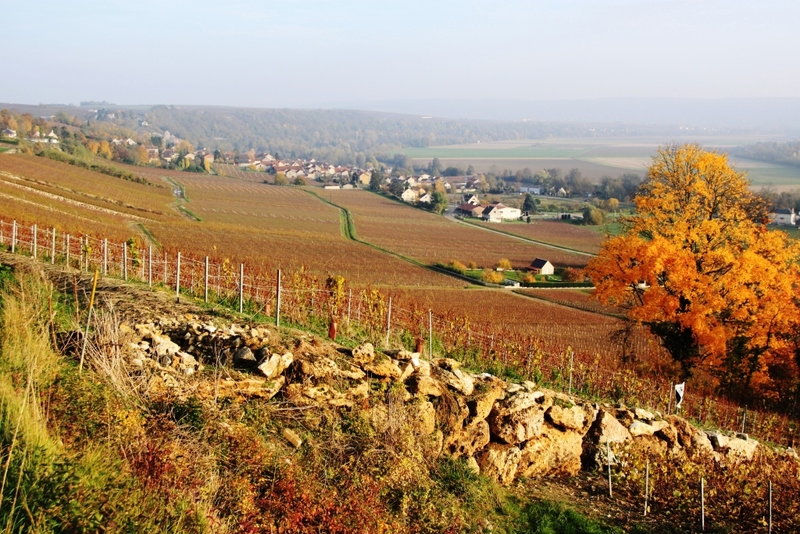 More facts: There are more than 19,000 independent growers in the Champagne region; around 5,000 of these growers produce wine from their own grapes. A Grower Champagne can be identified by the initials RM (meaning Récoltant-Manipulant) on the wine label (we learned later). And this was what we were looking for, not the big brand names but the smaller independent makers. 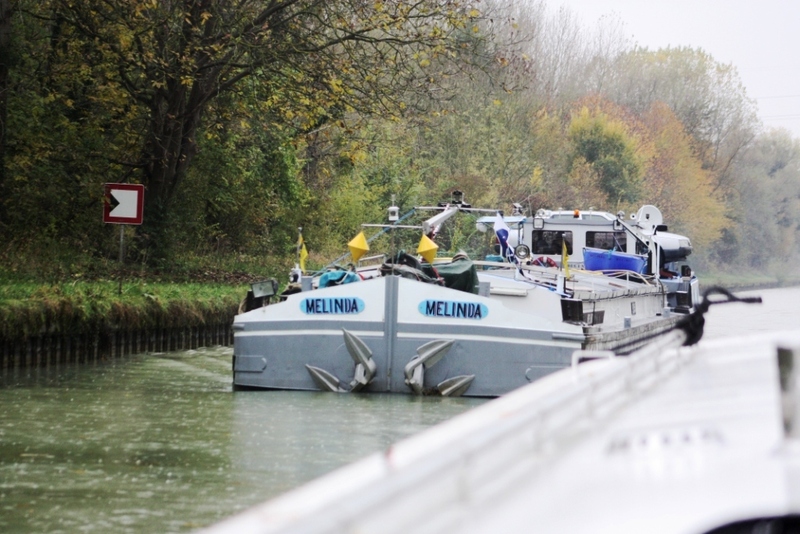 On our hunt for such a place we’d chosen to stop at Ay not far from Chalons, but on approach into the mooring we could hear a loud crunching sound. It was Endellion touching the bottom. We actually beached and had some trouble getting off again, very scary. No way could we stop there although this was the last place before being launched finally into the river Marne itself (rather than the canalised section). With no choice we headed onwards and entered the Marne river through the lock with quite a whoosh – there was a lot of water running to Paris and we floated around somewhere in the middle. 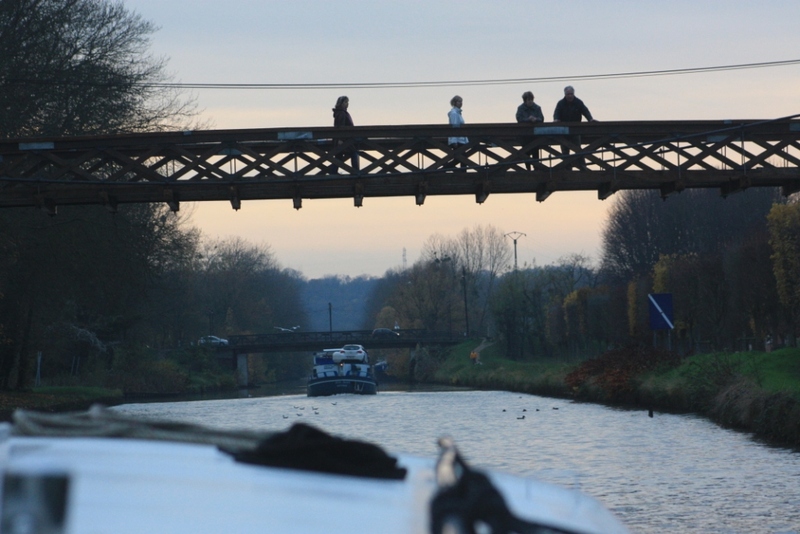 There were a few commercial barges around but despite the many bends all went smoothly if a little faster than our usual speed – up to 12 kilometres an hour and very low revs. 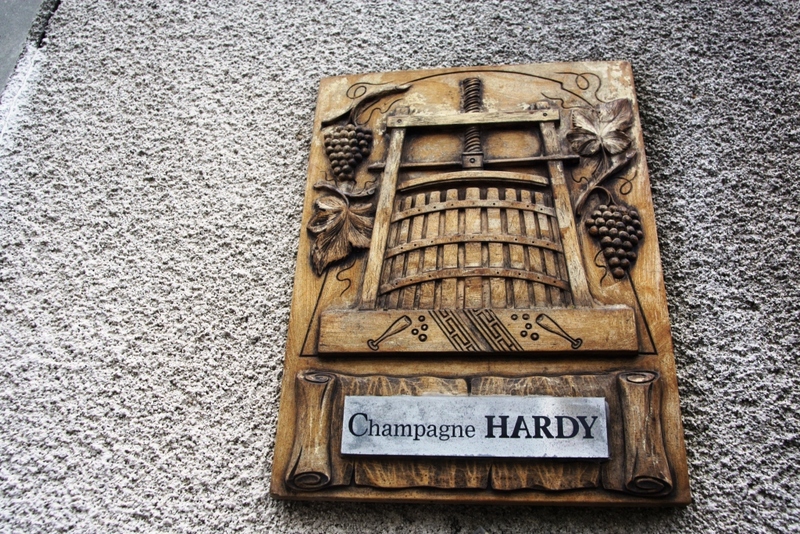 Hardy Champagne .. we didn’t get to taste this one, next time we hope. Some grapes still hanging around after harvest. 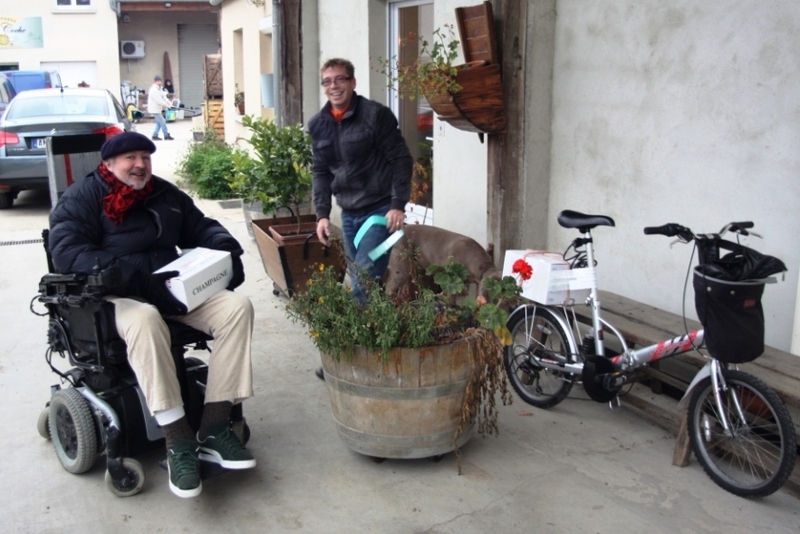 Our next stop was Damery where we found just what we were looking for in the middle of town: a delightful winery called Andre Goutorbe. Here we were greeted by the husband and wife owners; he continued working outside and Laure (we found out later) invited us inside to a warm and cosy room. She happily chatted through the story of the winery which was fifth generation with around 32 hectares – not small but not big, as Laure confirmed. As we tasted she sat down and joined us with a glass of her own Champagne .. delightful. We were in their main house whilst the official tasting room was being renovated and in our view this was so much nicer as it was lived in and comfortable. She told us about 85% of their wine was sold to Belgium (very close by she said) and soon after a Belgian couple arrived. They’d phoned ahead and were going to buy 24 cases for their local Lions Club. 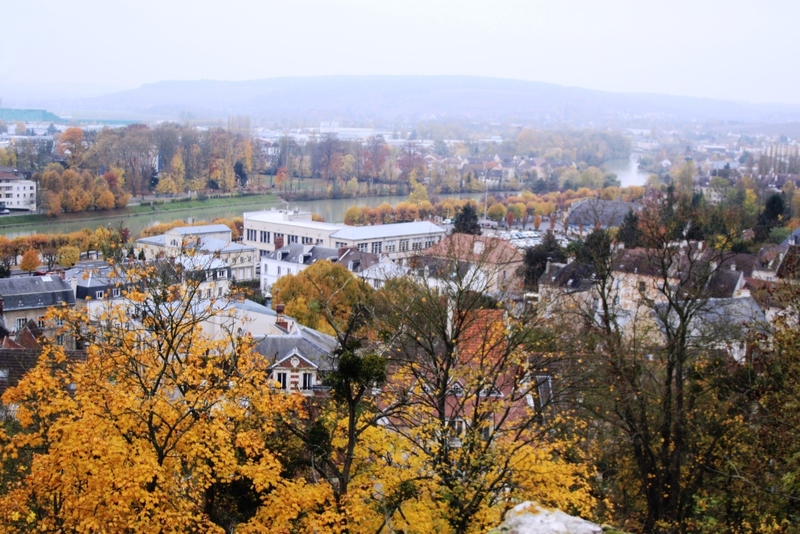 A wonderful view across the river Marne valley. With a case and a half of Champagne now tucked away on board we travelled on to the town of Dormans where we found a mooring on the edge of a field. It was part of a camping site which was closed for winter and the driveway had several barriers down and locked to get to the road. A man trimming hedges said he could open it for us with his key but we had to be back by 4.30pm, it was already almost 4.00pm so that wasn’t going to work. Stewart leaving Endellion to cross the field at mooring at Dormans. We could use the exit via the skate board area under the bridge, he explained. So off we set across the field, getting bogged a bit but made it and into town. Here we visited the Tourist Office where a totally delightful woman talked through what we could see in town, not much (at this time of year)! She was lovely, recommending a restaurant and a few wineries in outlying villages. Stewart asked her about a key to get us in and out across the road rather than the boggy field. Let’s see, she said, and made a phone call. Soon after a man arrived with the key to the camping site and all the gates. What a miracle and how nice and trusting of them. There was no charge for our use of the mooring which came with electricity and water. Packing up the Champagne, one box on my bike and the other on Stewart’s lap. 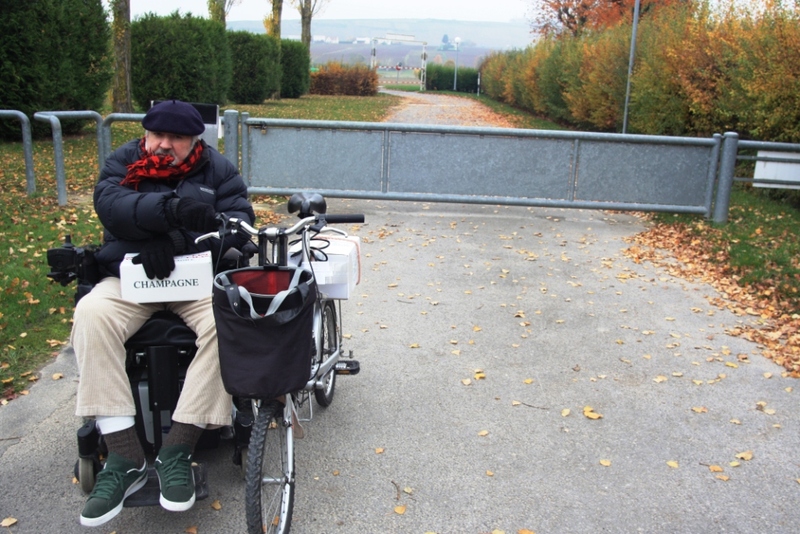 With our access organised we set off to the two villages of Chavenay and then Soilly for the Champagne makers, a round trip of about five kilometres. Champagne on his lap, setting off again touring near Dormans. As always we love our field trips .. just wheeling along the countryside, up and down gentle slopes and soon we were into the first village perched slightly above Dormans. We found one slick-looking Champagne house but it was closed, then more to our taste a relaxed place where we sat inside in the warm sampling their delicious bubbles! Finally back to the Camping Site, unlocking the barriers with our own key to pack the Champagne away on board Endellion. The challenge though was getting the Champagne to our boat. In the previous town, Damery, our lovely host delivered it to the boat in her car. Here we had the same offer but it would have been very complicated organising the opening of the gates across the camping site so we decided we’d strap one box to my bike, and the other could perch on Stewart’s lap! All arrived safely back on Endellion, now added to our stock for our Christmas festivities. Pointing Endellion through the arch of a bride along the flowing river Marne, not always easy. We were by then very close to Paris and with only a few more stops on our agenda we headed for Meaux, famous these days for their Brie de Meaux .. so we were in Brie country. A lovely mooring at Saint Jean. Unfortunately from here, as has happened to us in the past when heading into Paris, we had a major mechanical challenge. The beautiful bridge at Meaux. The river Marne is quiet, just a few peniches and onlookers as evenings get dark very early. The mechanic who installed the system: he reminded us it was Sunday, ie, he couldn’t help us, and he was “too busy” on the Monday and Tuesday. Maux, the closest (only ten kilometres or so away): Nautic Center – 01 64 34 19 88. Had to leave a message and could see from the website they didn’t open on Mondays! Naturally our breakdown had occurred late on Sunday. Later Guillaume (the lock-keeper) gave me another number for the same people (from his Yellow Pages): 09 54 54 53 29 where we received another message saying they’re not open today, Monday. But when we rang on Tuesday we talked to someone in English (finally) but they promised to ring us back and never did. Nogen Marina (around 20 kilometres away): 01 41 93 13 57. A helpful lady gave us the telephone number of a mechanic: Francois 06 80 87 11 00, but again we had to leave a message. No response so we also texted .. nothing. Must also be on ‘holiday’ Mondays! We never heard back from this one. 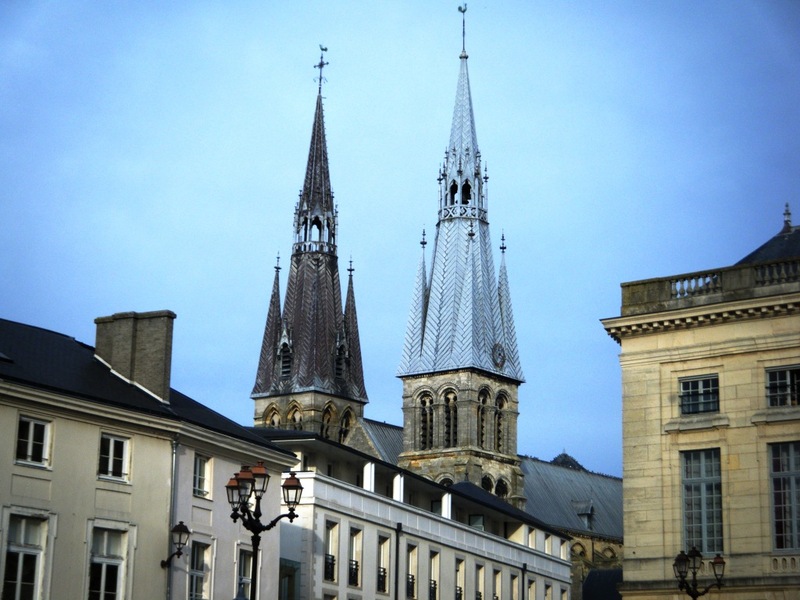 Melun (the other side of Paris but the next closest from Guillam’s telephone directory): 01 69 06 99 09. Recorded message saying they close Mondays!! Paris (provided also by Nogen after a lost day and ringing them again): Anne from MecaSeine on 06 16 02 76 65 who will contact her Mechanic and finally we found someone who would help us. With Anne’s help we got someone prepared to visit us and unblock our water intake. This turned out to be Nuno who was very efficient. After dismantling our entire water filter system and using a screw-driver to pierce the blockage and pull out all of the leaves we finally had water gushing through the open intake once again. This only took three days to achieve! 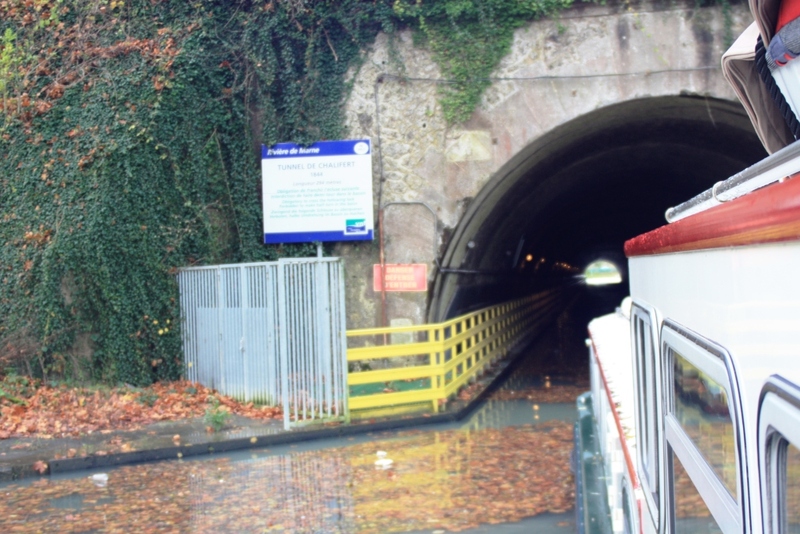 The tunnel de Chalifert and what were now becoming a problem; leaves that blocked our water intake. The following morning we could get under way again and into Meaux at last where we had a great mooring although with no electricity: Not a problem as we intended staying only one night. But, overnight the water level of the river had dropped at least two feet (60 cms or so). We had arrived with our stern deck level with the quay and now we were so far below it we had to use a long ramp to exit. It seemed the VNF (Waterway Service) lowered the level for some works. No-one could travel for the next three days, Friday and over the weekend. By Sunday night the river level had started to rise .. and rise. 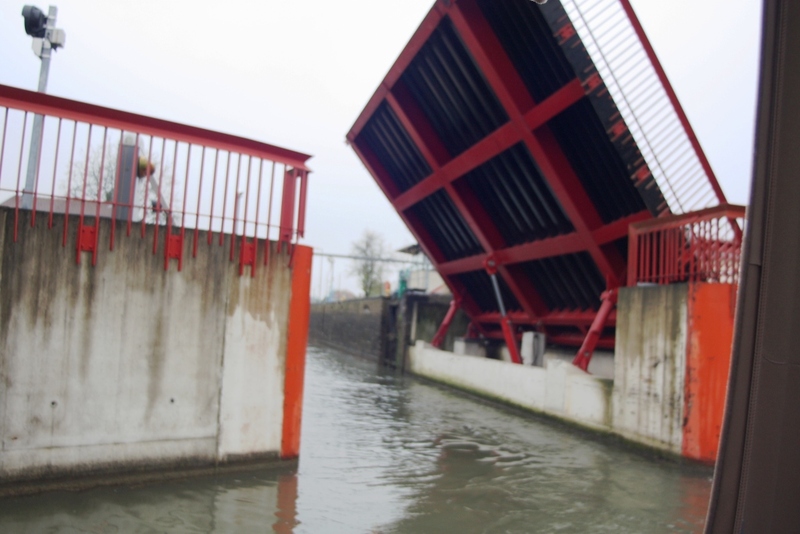 We ended up on Monday morning almost one foot above the quay (30 centimetres) – that was a water rise/fall of three feet or almost a metre. Finally all the commercials barges could get under way again and we had a long wait as they had priority. It was very late in the afternoon before we could leave Meaux and head on to Nogent, only twelve kilometres from Paris, and our winter home. 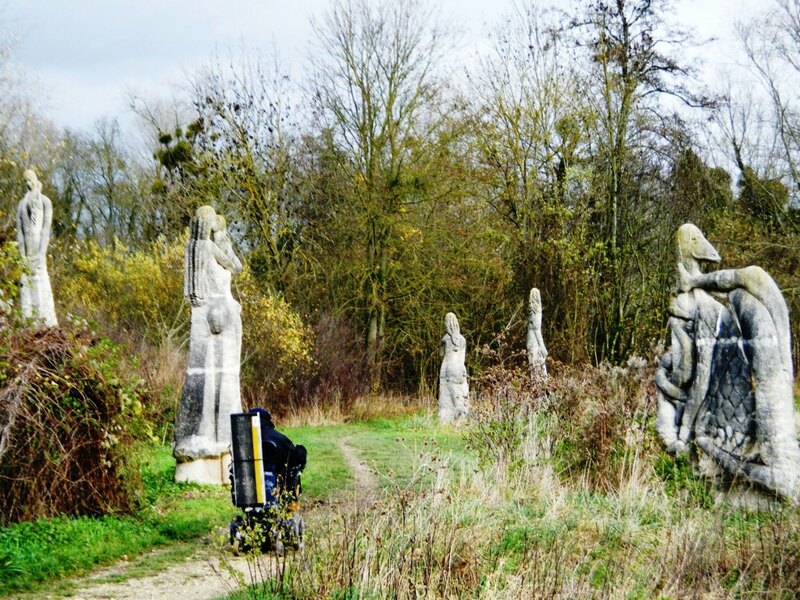 A totally delightful surprise find, the sculptures at Jardin des sculptures de la Dhuys, not far from Lagny. 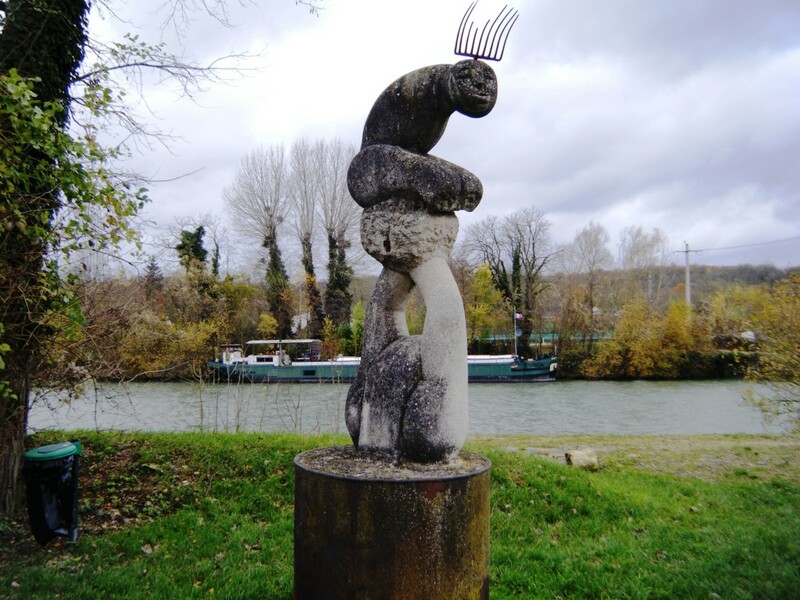 On the edge of the river Marne there are around forty huge and wonderful sculptures. 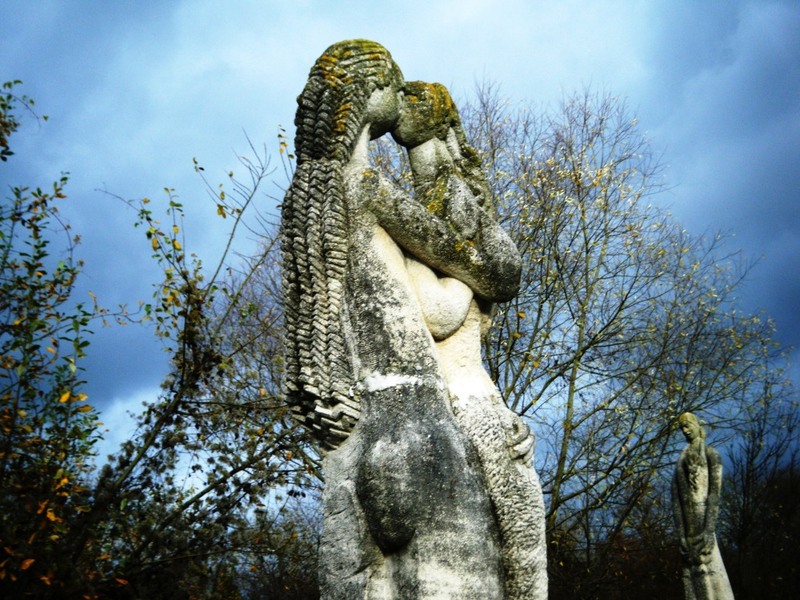 Created by Monsieur Jacques Servieres from stone from the aqueduct that crossed the Marne (or river Dhuys) which was destroyed in 1939. More here: http://www.jardindesculpture.net. We’d just about had enough of stops and starts (we had one more blockage of leaves in this short trip and had to get Nuno back again to unblock us) but the stop a Nogent was essential chiefly for fuel. The Capitainerie (Harbourmaster and assistants) couldn’t have been more helpful although what they couldn’t assist us with was the fuel. It was there in the tanks on the nice pontoon but was self-serve with a credit card. It’s not easy using those self-serve systems especially when they take only a maximum of 200 Euros at a time which meant stopping and starting the system several times to get the amount of fuel we needed. In the end we had to leave one of our three tanks (not essential) empty given the credit cards would not be accepted at the same outlet multiple times before being rejected. Finally, almost a week ago, we made it safely into Paris to be greeted once again by our friends and neighbours as if it was our local village of old. Well, it is in a way – now our third winter in this superb marina. 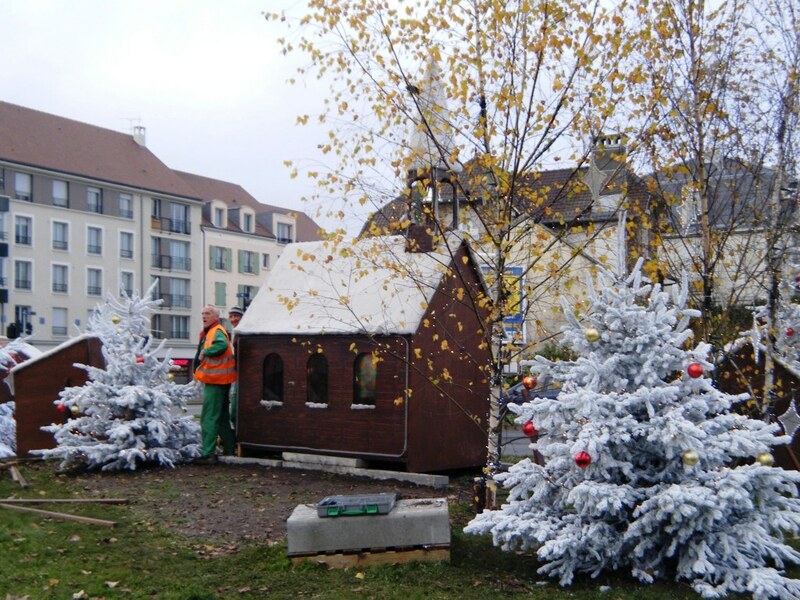 Decorations and nativity scenes are being put up as we get closer to Paris.. and Christmas. Since June when we left Paris we have travelled around 2,500 kilometres, taking 392 engine hours averaging 6.3 kilometres an hour. This compares well to our original Yanma engine which gave us an average of 4 kilometres per hour with the same rate of hourly fuel consumption. So the Steyr has proven to be a good investment given our size and weight. We’re planning a quieter and more relaxed travel itinerary for 2013 .. no firm plans as yet. Meanwhile, we’ll be bundling our Christmas presents into a hire van and driving off to Cornwall for the festive week.. can’t wait! Wishing our friends, family and other blog-followers a wonderful Christmas and happy New Year. 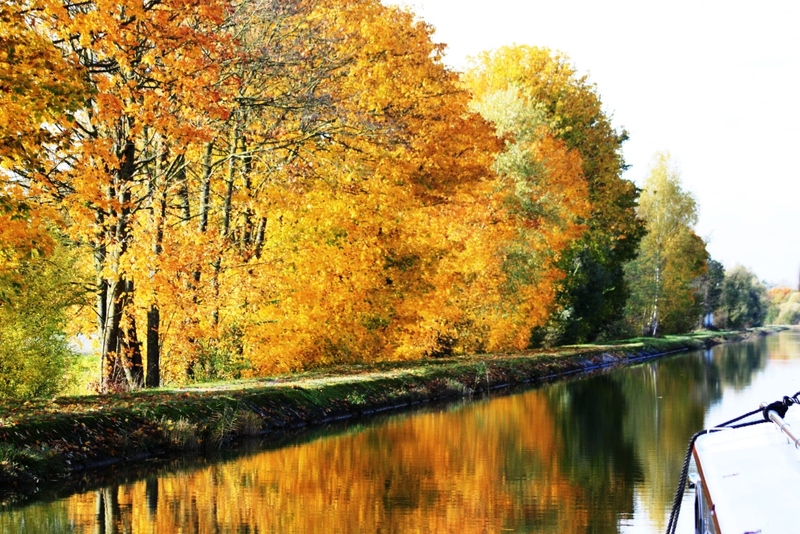 This entry was posted in Accessibility, Multiple Sclerosis, Waterway life, Waterway services, Wheelchair and tagged Armistice Day, Boat services, Endellion barge, MS, Paris, Ship repairs, Travel, Waterway services, Wheelchair access. Bookmark the permalink. As ever a great read and look at your wonderful journey. It’s hard not to wish myself there particularly when I read about the quiet, walking pace averaged through that beautiful country so well captured in both photo’s and words. 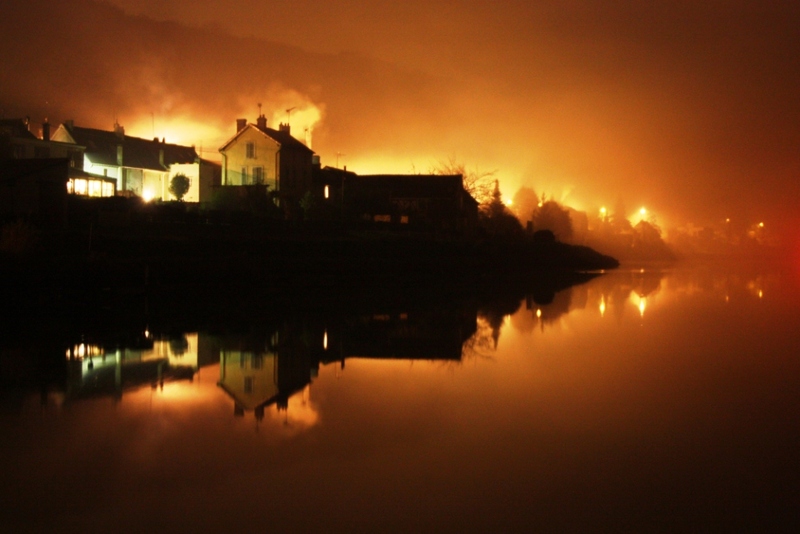 I particularly like the shot of Stewart headed down the road near Dormans and what a gorgeous sunrise/set? In St. Jean. Have a wonderful Christmas and enjoy the English speaking. Many thanks Peter .. we wish you all the very best for 2013, after a spirited Christmas! For us we will love the English speaking, with a strong west-country accent!